(also very similar: orange oak bolete (Leccinum aurantiacum) and orange aspen bolete (leccinum insigne) – distinguished by habitat. Identification – 4/5 – OBB – Its hard to mistake these impressive fungi, with their orange caps, pale stems with dark scales (squamules) , grey pores and tendency to turn blue around the stem base when cut or handled. Don’t be alarmed by this – treat it as a welcome aid to identification rather than something scary (see picture at bottom of page). BBB is more or less identical, only with drab brown caps of various hues depending on how young/wet it is, and an inclination to bruise grey rather than blue. 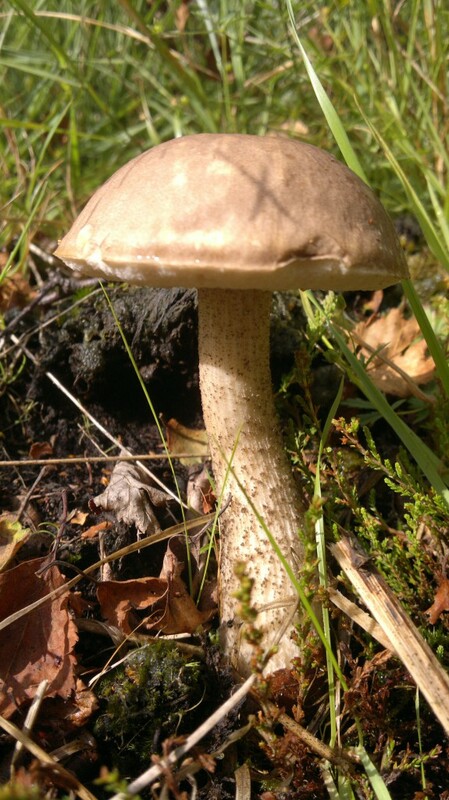 There are a number of similar leccinum (scaber stalk) species, all of which share the more or less squamulous stipe. Identification to species is based on habitat (i.e. tree type they are found under), cap colour and colour changes (blue, red, dark bruising) on cut stems. None are known to be toxic or inedible, but some are harder do digest than others. See notes on a couple more below, and consult a field guide for the full range. Distribution – OBB – 3/5 – Not uncommon in their habitat, though far less common than BBB (5/5), which are often hyper abundant under birch. Habitat – Under birch trees and no other, August – November. 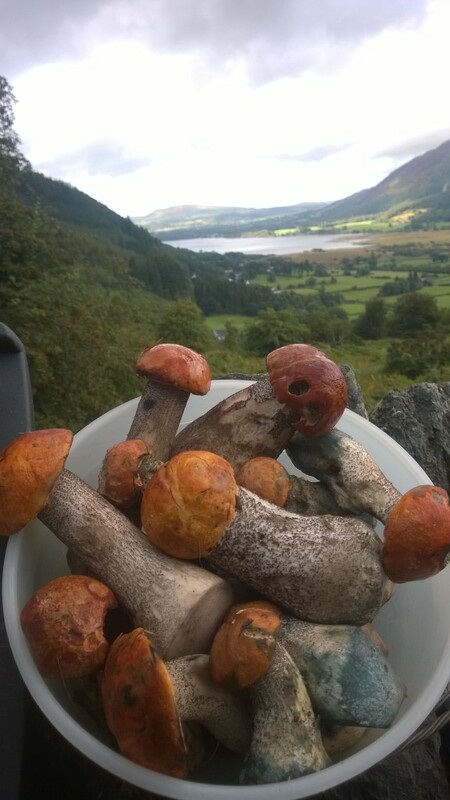 If you find an orange capped mushroom that looks very similar growing under oak or aspen, you probably have an orange oak bolete (Leccinum aurantiacum – edible and excellent) or orange aspen bolete (leccinum insigne – edible but with some reports of adverse reactions). 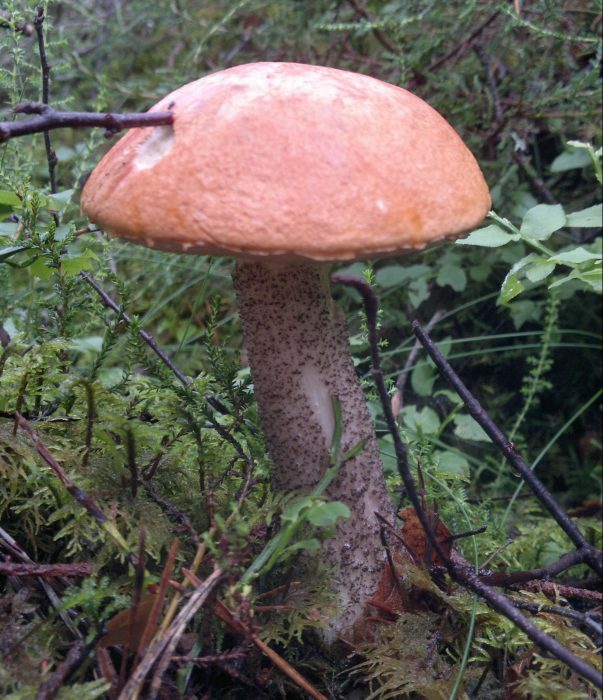 While not quite in the same class as ceps, orange birch boletes far exceed their more common brethren, the brown birch bolete (leccinum scabrum), in texture and flavour. Look for somewhat phallic younger specimens only under birch trees (especially scrub birch and birch wood edges), particularly on acidic, scrubby/heathery ground. They can grow to substantial sizes, but once they start to feel spongy its best to dry them for future use. Drying results in an improved flavour on reconstitution. Orange birch boletes can get pretty big. If you come across an OBB (to its friends) that isn’t growing beneath birch, but under oak trees, you may well have an OOB – orange oak bolete. Word is, these are even tastier, but never having found one, I can’t comment. They seem to be more common in the South of England. We don’t get many aspens in Scotland, but on a trip to NW Canada I encountered a lot and found lots of orange aspen boletes below them. 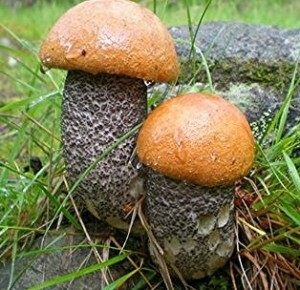 Orange aspen boletes have been reported to cause adverse reactions in a few people – my advice would be to eat only the young caps, well cooked. I really enjoyed them. None of the scaber-stalk (leccinum) sub-family of boletes (pored mushrooms) will do you much harm, though many aren’t particularly rewarding eating. I get countless pictures of BBB’s sent to me by people thinking they have found ceps. They are nowhere near as good, though young, firm specimens are well worth picking, and often reward a forage in huge numbers when not much else is about. I’m told that in some areas of Eastern Europe the OBB is esteemed above the cep. This is hard to justify purely on taste grounds, but they are certainly more rewarding picking, being much more resistant to maggots. Hi I picked some brown birch boletes and have had a go at drying them in the oven at 100°c turning them every 10 mins interestingly the older larger specimens which I had less hope for kept their colour much better after drying although they were much harder to put through the mandolin..the younger ones have all gone really grey where the white once was it this acceptable?can send photos if you like…a response would be most welcome! Hi Josh, Discolouration while drying is normal with these species. The stipes of older specimens can get quite tough and harder to digest – drying and powdering is the way to go. 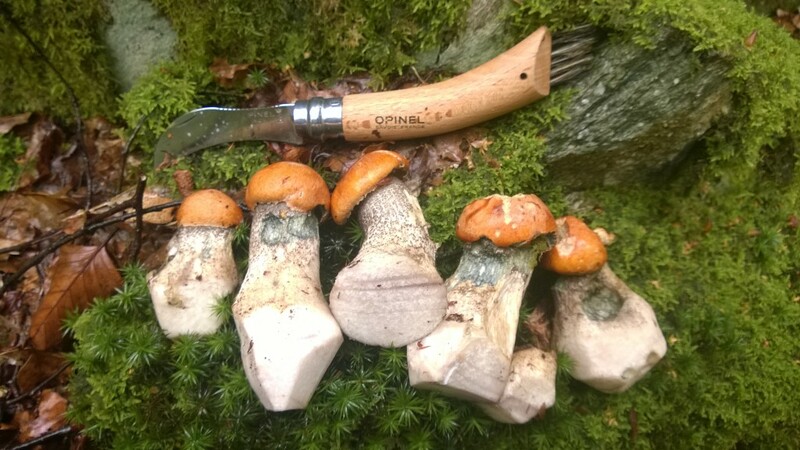 Found some beautiful orange birch bols in Perthshire this week – dont normally see the orange ones in good condition – cooked the stems only as caps quite softish; however had very bad diahorea 12 hours later , which I am putting down to the mushrooms. Luckily didnt give to my elderly parents with the tea. Just a cautionary note – I am well experienced in mushrooms otherwise – maybe best to go gently with these ones to see if agree with oneself, before going in head first. David, West Lothian. Sorry to hear you didn’t get on. Good advice: Eating anything for the first time, but especially fungi, is a step into the unknown. Eating a small amount, well cooked, is always the way to go initially. Personally I remove the tough stipes of older specimens as they just look tough to digest. Drying is the best way to go with soft caps. There are a range of orange leccinum, mostly distinguished by habitat. Some are more easy to digest than others. Just want to say thank you for all of the interesting information and pictures. I am confused about Boletes. 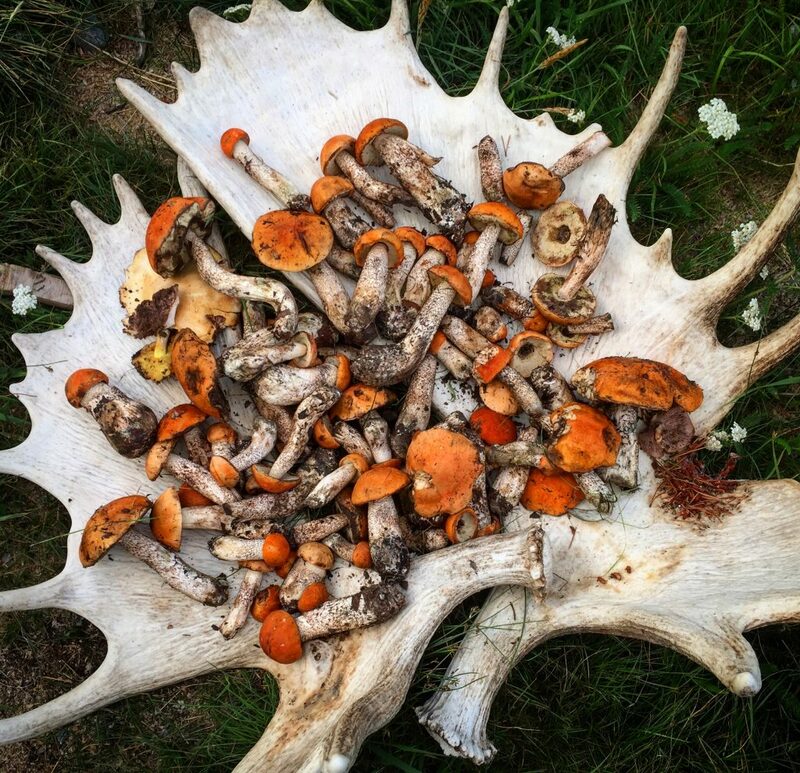 I saw few beautiful specimens with nice reddish-orange caps and “scaly trunks”. I cut gently one off and it bruised right away at the cut. I just have a hard time distinguishing pictures from real looking mushrooms. Hi Mark. This is my first comment on this site after lurking for a while, and it’s in favour of an apparently mediocre mushroom. At any rate, I sliced it and fried it in a little olive oil in the bottom of a small saucepan until the slices went crispy and I’ve got to say I was pleasantly surprised! It was very savoury and more-ish. I was going to wait until my mum came back to the kitchen after taking my dad a cup of tea but, alas, my resolve was lacking. I scoffed the rest. Now, this may be down to individual tastes, my luck with an individual specimen or my palette of low expectations. Either way, this mushroom definitely has the potential to serve a forager well and I look forward to finding more. At any rate, I love the site. I live in the south/south west of England and have for a couple years been hankering to do pretty much exactly what you have done on this website. Explore all the wild plants and fungi of Britain and find unexpectedly exotic, unique or otherwise notable flavours and spices hidden in our fields, woodlands and hedgerows, which started when I first nibbled the lemony bite of wood sorrel and was determined to prove that for many exotic spices we import, there is a plant or fungi which provides an equivalent, or even something fairly unique such as in the form of Angelica, with its aromatic sweetness reminiscent of Victorian-styled medicinal sweets. It’s my aim to help raise Britain’s awareness of its native, wild spice rack and vegetable allotment and growing them with the admiration and respect one gives Mediterranean squashes and exotic chilis. I’m glad you enjoyed your BBB Jeremy. Young firm ones can be pretty good, especially crisped a little. Pleased to hear you are exploring our native spice rack. I guess you have listened to the Radio 4 programme we made and read my blog on it..?